Historically, poisoned or affected water supplies have caused the outbreak of disease and panic. In 1892, a year which saw the staging of the Chicago World Fair and the outbreak of typhoid, the threat of water scarcity to the 27 million guests attending the city’s events propelled the construction of plumbing stretching four miles into Lake Michigan. Additional supplies were also obtained from Waukesha and Wisconsin. The same, it can be said, for water that flows off, water that is pinched, or water that is denied. The entire basis of Jean de Florette, Marcel Pagnol’s novel set in La Bastide in a provincial France teeming with avarice, is that of a water tragedy. A hunchbacked tax collector goes to the country to make good his inheritance, but faces the cruelties of a drought. He needs water, and the only way to obtain it from a neighbouring well is with a mule owned by his rivals who entertain his demise. A contemporary tale of water tragedy is that of the Murray-Darling Basin, which has suffered from illegal pumping in the Barwon and Darling Rivers that could, if proven, “represent,” according to Ross M. Thompson, “one of the largest thefts in Australian history.” Such instances of theft were uncovered by the Australian investigatory news program, Four Corners, in its Monday airing. Deputy Prime Minister Barnaby Joyce, who also doubles up as the federal minister for water issues, pushed a different narrative to his pub audience in Shepparton, Victoria, suggesting that the Four Corners program had done the farmers wrong. Water was taken, he explained, and “put back into agriculture, so we can look after you and make sure we don’t have the greenies running the show.” Few voices were on hand to speak for the environment that day. South Australia’s Water Minister, Ian Hunter, was that incensed to call for an independent review of the handling by the New South Wales government. As with so many matters of national significance, the solution will entail more squabbling skirmishes. The NSW government was never too thrilled with the agreement. Known as the Murray-Darling Basin Plan, it had begun as a Commonwealth and State arrangement to balance water consumption and the environmental health of a dying basin. A water market was also created under the plan to enable water to be purchased with an environmental perspective in mind, and allow irrigators to trade water permits focused on need. Rather optimistically, all of this was meant to take place transparently and with a degree of prudence. But irrigators were bound to buck moves to control water usage, and colluders abounded within the emerging water bureaucracy. In 2016, discussions between a particular NSW water bureaucrat, a certain Gavin Hanlon, were held with irrigators on the possibility of abandoning the Basin Plan with minimal legal consequence. When evidence came to light to the Deputy Director General of the NSW Department of Primary Industries on misuse by irrigators in the northern part of the state, heads turned the other way. The appetite for compliance, according to Jamie Morgan of the strategic investigations unit, had run its course. Ambushed by the Four Corners expose, officials in the NSW Government have promised an investigation, with the state’s primary industries minister, Niall Blair, clear that some form of punishment will issue. South Australian premier, Jay Weatherill is not so sure, insisting that this is a matter concerning all states including the Commonwealth. He is pitching for a judicial inquiry that is beyond the tampering of political interests. The irrigation pinch has resulted in the appropriation of billions of litres. 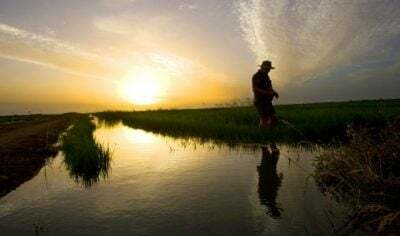 The Murray Darling Basin plan has been shown up, a costly sham further exacerbated by increasingly voracious irrigation capture by farmers spurred by government subsidies. The Murray Darling Basin Authority board has also been compromised, a state of affairs that risks being hastened by the appointment of another irrigation lobbyist, Perin Davey. Much to the consternation of the Australian Conservation Foundation, the MDBA board is now packed with the Daveys and the Hanlons, Trojan horses tearing down the entity from within. One Australian politician, South Australian senator Nick Xenophon, suggests splitting the environment portfolio from agriculture. Whatever cosmetic stitching takes place, going balmy over water and its use will persist, leaving the environment to wither before the needs of humankind.